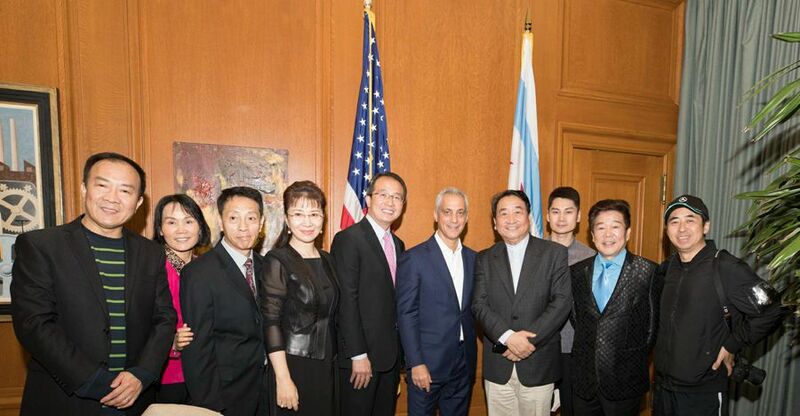 On October 2, Consul General Hong Lei and the Chinese Quyi Artists Association troupe met with Chicago Mayor Rahm Emanuel. Consul General Hong Lei introduced to Mayor Emanuel key members of the troupe which performed at Chicago in celebration of China’s National Day and the Mid-Autumn Festival. Mr. Jiang Kun, Troupe’s leader, renowned crosstalk artist and Chairman of the Chinese Quyi Artists Association said that knowing the Chicago city government is committed to becoming the most China-friendly city in the United States, therefore the troupe has chosen Chicago as the first stop of its overseas tour. The Chinese Quyi Artists Association devotes itself to the development and prosperity of the Chinese folk art of storytelling and singing, and promotion of China’s splendid cultural heritages. The art of crosstalk which Mr. Jiang Kun practices is a popular art form among Chinese communities across the world, bridging Chinese and world cultures. Jiang Kun said that he hopes Mayor Emanuel would continue to lend his support to the people-to-people exchanges, cooperation and friendship between Chicago and China. Mayor Emanuel expressed his welcome to the troup to perform in Chicago. The Mayor added that Chicago is the only city in the United States that has a growing Chinatown.It also has the largest Chinese language learning system at public schools. Emanuel stated that the Chinese community is a vibrant community, making important contributions to the economic and social development of Chicago. Chicago is a city with rich cultural heritages. As the birthplace of American blues, gospel music and jazz, Chicago holds the largest music festivals featuring the three music genres in the US every summer, presenting the local community with popular cultural events. The city of Chicago is willing to strengthen cultural and artistic ties with China, promote exchange of visits among artists, bring the best art of the two countries to the two peoples, and promote friendship and mutual understanding between the two peoples. President Lily Tan and artistic director Wu Hangjian of the Chicago Chinese Performing Arts Ensemble also attended the meeting.